In an unfortunate move that was easily predictable, the Iraqi government released Hizballah fighter 'Ali Musa Daqduq. Daqduq immediately returned to the safety of Beirut where he is considered a hero by his Hizballah colleagues. 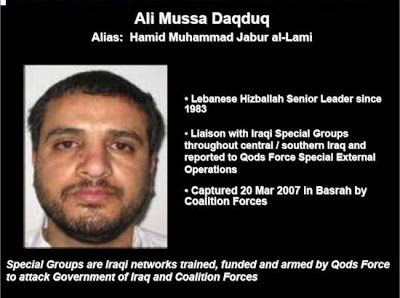 Daqduq was accused by American forces of organizing an attack in the Iraqi holy city of Karbala' in January 2007 - that attack resulted in the death of five U.S. Army soldiers. Daqduq was in Iraq at the behest of the Hizballah's primary sponsor, the Iranian Islamic Revolutionary Guard Corps' Qods Force. Daqduq's mission was to train Iraqi Shi'a militias in Hizballah tactics. Many military analysts consider Hizballah to be among the most effective guerrilla forces in the world. Daqduq was captured by British forces in the southern port city of al-Basrah a few months after the Karbala' attack, and turned over to U.S. forces. At this point, internal American politics came into play. The Obama Administration, in its misguided interpretation that terrorist or insurgent attacks are crimes, wanted to bring Daqduq to the United States for trial in a civilian court. Other officials wanted to transfer Daqduq to the detention facility at Guantanamo. I side with that latter group. The Obama Administration refused the transfer to Guantanamo, citing its desire to close the facility. Thus, no action was taken for over four years. In its rush for the exits in December 2011, the Administration transferred Daqduq to Iraqi custody. Although Iraqi officials assured the U.S. they would prosecute Daqduq, I don't know of anyone who thought that would ever happen. It didn't. In May 2012, an Iraqi court ruled that there was insufficient evidence against Daqduq and ordered that he be released. Although the Iraqis continued to detain him during a sham appeals process, they upheld the initial ruling, refused an American request for extradition, and set him free. This is what happens when you quit a war and fail to maintain any position of influence. I lay this at the feet of the President. Had he taken advantage of the provisions in the 2008 Status of Forces Agreement, we could have maintained a presence that might have stopped this travesty from happening. Quitting a war never wins it, never ends it. All the President did was hand a victory to neighboring Iran. That is the clear result. Iraqi Prime Minister Nuri al-Maliki had a choice. Listen to the United States (in the persons of the vice president and U.S. 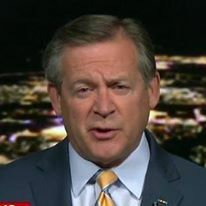 Ambassador) and engineer a way to hand Daqduq over to the Americans, or follow the counsel of the Iranians - his fellow Shi'a and political masters - and release a member of their primary proxy terrorist organization, Hizballah. Given the fact that Daqduq is in Beirut, we see who wields influence in Iraq. The timing of Iraq's release of this Hizballah terrorist is also telling. The Iraqis chose to delay the order of the Iraqi court until after the U.S. presidential election. They wanted to make sure it did not negatively impact the re-election chances of what both the Iraqis and Iranians perceive as a weak American president. Senior Iranian leaders stated earlier that an Obama re-election was in the interests of the Islamic Republic. I guess we now know how much sway we have in Baghdad. Thank you, Mr. President.